Following is an excerpt from Sharon K. Souza's Christmas novella, A Heavenly Christmas in Hometown. We hope you enjoy our launch of the Christmas season. Rehearsals were a frantic affair with Christmas Eve just a week off. Tim worked with the choir, while Bev directed the drama. Everyone worked on the props, including Eustace and Spencer. It was awfully cold that December, everyone said so, and poor Spencer just couldn't adapt. "You don't suppose it was like this when Jesus was born, do you?" he asked, wrapping a muffler around his neck. He remained in a constant shiver, and had to set his jaw to keep his teeth from chattering. "No, I don't think so, Spence," said Eustace, "but He was born in Bethlehem, not Hometown, you know." "Quite. I doubt Bethlehem has seen a flake of snow from that day to this." "It sounds like an inviting place." He looked out a window at the white mounds. "It's nice to look at, but it's so unpleasant in every other respect." "Many folks would disagree. Really, they would. Look at the children. They enjoy it immensely. If Heavenly Chalet were completed, you'd see just how recreational winter can be." "What's the matter, Spence? Getting a little homesick?" "A lot homesick, actually. I can hardly remember what it's like to be warm." "I expect you'll find out before long." Eustace nodded. "Yes, I do." "I've given the choir a twenty minute break," said Tim, joining his friends. "Thought I'd come see how the stable's progressing." "If it looks half as good as the choir sounds I'd say we're doing well." "Thanks, Spencer. Wow! It's amazing what can be done with a little cardboard and paint. You two have a talent for this. It's the most authentic stable we've ever had." "It was Eustace's design," Spencer said. "I just made a few little changes on the old one. If you don't mind, I'd like to make an adjustment or two on the manger. It looks more like a cradle on legs than a feeding trough." "Be my guest," Tim said. "You're doing a great job." He left them to check on costumes. "What's a feeding troth?" Misty asked. "I thought you were outside throwing snowballs at your brother," Eustace said. He hadn't seen her come in with Tim. "I was, but he threw some back and I got cold." "Oh." Spencer knelt down beside her. "I can certainly sympathize." She took off her wet mittens, blew into her hands, then rubbed them together. "What's a feeding troth?" she asked again. "It's a feeding trough," Eustace corrected, "and it's a wooden box where hay and other feed was placed for the animals in the stable. Joseph and Mary used the trough as a bed for baby Jesus." "Mama said they put baby Jesus in a manger." "And your mama's right. Manger is another word for feeding trough. It just sounds a little nicer." "Why did they put baby Jesus in there and not in a cradle? I had a cradle and so did Raymond. Mama lets me use it for my dolls now." "I'm afraid they didn't have a cradle." "But Joseph was a carpenter. Why didn't he make one?" "Well now, Misty, that's a very good question. I think Joseph probably did make a cradle for baby Jesus, but they had traveled a long way from where they lived in Nazareth to Bethlehem where Jesus was born." "I've heard of Nazareth," she said. "They couldn't carry much on that trip, certainly nothing so big as a cradle, and I think they both were hoping they'd get back home before the baby was born. But it had to happen just the way it did, for a prophet -- do you know what a prophet is?" When Misty nodded Eustace continued. "For a prophet named Micah had foretold that baby Jesus would be born in Bethlehem long before it happened." "God knows everything, doesn't He?" "Then why didn't He put a cradle in the stable so that baby Jesus would have a bed?" Spencer and Misty both looked to Eustace for an answer, but he was obviously stumped. "Well, now. I'll have to work on that one," he said, and returned to the task at hand. 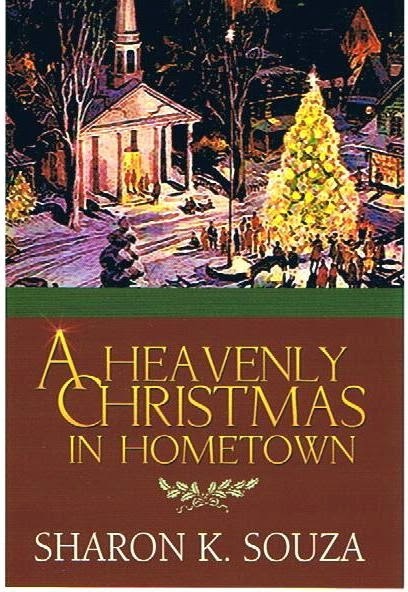 A Heavenly Christmas in Hometown is a lovely little hardback with dust jacket that can easily be read in a few sittings and enjoyed by the whole family. For ordering information, contact Sharon at sharonksouza@gmail.com. Lovely, tender passage. I have this book and it is a treasure!